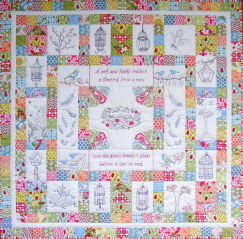 I am very pleased to present my new Block of the Month entitled “On Freedom’s Wings”. I received it back from my very talented quilter, Jody of Daisy Patch Quilting, yesterday and couldn’t wait to finish it off last night. I think she did a terrific job. I have always loved birds and their ability to just glide on a breeze. I love bird houses & cages too. However I love the freedom that birds represent and this is why my cages are all empty. The fabric range I used in this quilt is called “Verna” by Kate Spain for Moda. It is a very pretty fabric. 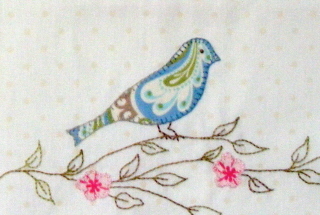 I have used a layer cake plus fabric for the stitcheries. It is 47″ square and could be made in any fabric range or from the many fabrics we tend to have in our stash!!!! 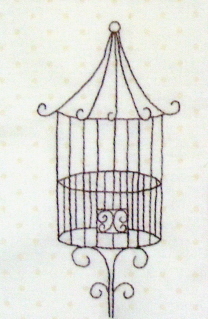 At the moment I am busily writing the patterns so they will be available very soon. I do hope you like it. I am also making it in a black/white/aqua version which I think will look quite effective. I’ll be back as soon as I can once I finish writing. My part time work has also had a significant increase forecast over the next 2 months so this will slow my stitching time down considerably but I will post a black/white version when I complete a block.